Police are investigating a potential hate crime that started with a slur and ended with a knife attack. 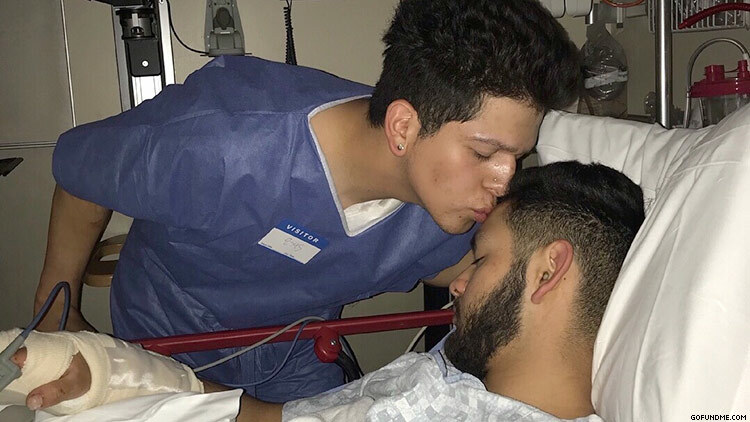 Chris Huizar, 19, and Gabriel Roman, 23, were walking home, hands intertwined, from a Denver nightclub Saturday when a man attacked them with a knife in what police are now investigating as a possible hate crime. After the verbal attack, the assailant stabbed Huizar in the neck, he said. As Roman tried to stop the attack, he was stabbed in the hand and back. The suspect has since been taken into custody and charged with aggravated assault. His identity is yet to be released to the public. As of now, the campaign has met its $5,000 goal. Update: Police have identified the suspect as 24-year-old Dylan Payne, who was arrested over the weekend and is currently being held for first-degree assault.